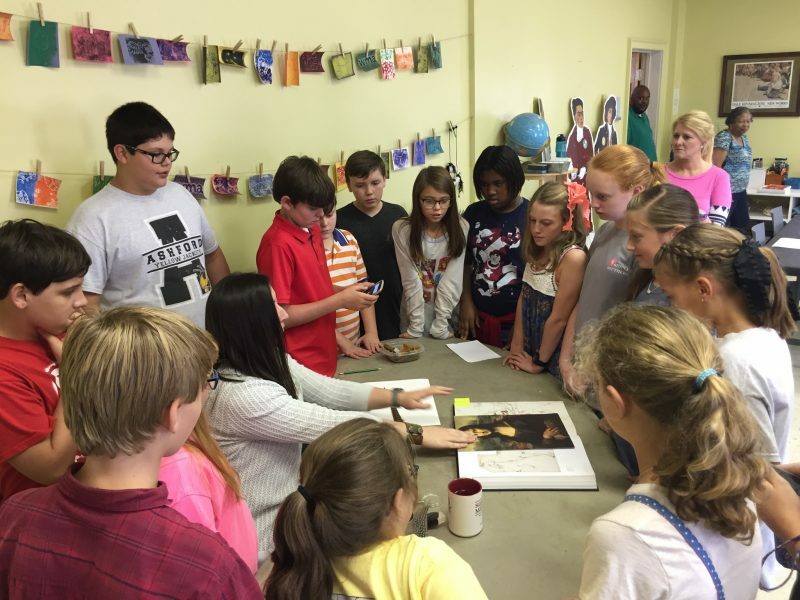 DOTHAN, Alabama – April 26, 2018 – The Wiregrass Museum of Art (WMA) is pleased to announce it has received two grants for youth art education totaling $10,000. A $5,000 award from Wiregrass Foundation will fund WMA’s six summer camp offerings, as well as outreach camps to the Hawk Houston Youth Enrichment Center and the Wiregrass Boys & Girls Club. A second $5,000 award from the Wells Fargo Foundation will provide continued support for the museum’s long-running First Saturday Family Day program. Because of the grant award from Wiregrass Foundation, WMA will be able to offer three scholarships for each of the six summer camps it will hold for the general public between the first week of June and mid-July: Discovering Art, Stop-Motion Animation Workshop, Arty Pants for Toddlers, Exploring Ceramic Forms, Clay Explorations and Art Around the World. Prices for camps range from $45 to $85 each, and camp sessions are available for students ages 18 months to 18 years old. All ages are eligible to apply for scholarships. A scholarship application can be found for downloading on the “Camps” page of WMA’s website – https://www.wiregrassmuseum.org/camps/. “Through this grant we are able to expand our reach through camp scholarships to ensure that every young artist has the opportunity to enter WMA and learn firsthand how art can bring a positive change by exploring their creativity and imagination,” said WMA Art Educator Amanda Holcomb. Students attending outreach camps from the Hawk Houston Youth Enrichment Center and the Wiregrass Boys & Girls Club will attend free of charge because of Wiregrass Foundation’s commitment to the program. The $5,000 award from the Wells Fargo Foundation continues that organization’s long-standing support of WMA’s youth education programming with a contribution to First Saturday Family Day, which offers a free come-and-go art activity for students of all ages led by Holcomb or another museum volunteer. First Saturday is a popular time for parents to explore the museum with their children and participate in other in-gallery activities. At the core of WMA’s mission is a focus on lifelong learning, and the First Saturday program specifically encourages intergenerational experiences in which preschoolers, school-aged children, parents and grandparents can all learn at the same time. All First Saturday activities are free, and the Wells Fargo Foundation’s renewed support for the program will allow WMA to continue to provide this experience to all its guests without a fee. The Wiregrass Museum of Art inspires a lifelong appreciation for the visual arts by providing innovative educational programs that engage diverse audiences through the collection and exhibition of quality works. Since its founding in 1988, WMA has offered educational programs, nationally-acclaimed art exhibitions and community events throughout the year. Its Board of Trustees guides the long-term vision and strategic goals, while its membership, City and County support, and grant funding provide the resources needed to fulfill its mission. Because of the scarcity of art education in schools, the WMA Board of Trustees and staff have the responsibility to provide quality, accessible exhibitions and to reach out into the community through art education efforts. WMA fills crucial cultural needs in the Wiregrass area.